If action-packed shooter games are your thing, then you can’t miss out on Contract Killer: Sniper. I, for one, have been playing it for hours now. And I’m not even a shooter games fan. Ups: When it comes to shooters, Contract Killer: Sniper is the real deal. Select your target, shoot, take cover, buy weapons, upgrade your ammo and defence, get experience, money, and special items by completing missions, or in Player vs Player Battles. Your goal? Become the best assassin you can be. There’s a bumpy road ahead of you, but once you build a strategy, and start earning some experience, you’ll feel like a fish in the sea. The graphics are really good. After all, it is a Glu game. And what I liked most is that even if you have more guns to use to complete a mission, you don’t feel overwhelmed by all the buttons on the screen. Contract Killer: Sniper is an intuitive game, and really easy to control. 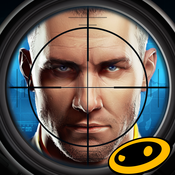 Downs: Contract Killer: Sniper is extremely addictive. Now, that’s not necessarily a downside for the game, but rather a downside for your social life. There are so many things you must do in this game, upgrades, missions, PVP battles, that there’s a good chance you’ll end up taking a couple of days off from work to finish the game. Other than that, the game might seem a bit too much to digest, at first. Not because the missions are extremely complicated, but rather because of all the options you have on your Home screen before starting the mission. However, the Tutorial will take you through each and one of them, so you’ll get a hang of them in no time. World of Warriors is also a battle based game, but far from being a realistic, action-packed shooter. Here, the battles are more medieval, and more fantasy-like. There are swords, and other weapons involved, but it’s not really what I would call a violent game. After all, there are cartoons that are more violent than World of Warriors. 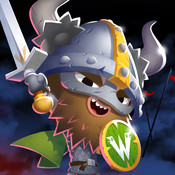 Ups: World of Warriors is a really engaging game, with simple controls, and cute graphics. Your job is to carry battle after battle, using one warrior, at first, then, building a bigger, better army, with every fight you win. Every fighter in this game has a certain special power, related to fire, water, earth, or air. So, there’s also a bit of strategy involved every time you form your army before a battle. You need to pay attention what powers the fighters in the opposite army have, so that you can form the most effective team that won’t only win you the battle, but also finish with at least one warrior unharmed. Train your army, buy more warriors, collect items and gold, get talismans to upgrade your warriors, and, before you know it, you’re living in the fantasy world of warriors. Downs: What I found quite annoying about World of Warriors is that, whatever you do, it involves a bit of loading. When you start a game, every time you start a fight, every time you finish a fight, and so on. It only lasts half a minute, or less. But if this is the only thing you’re doing in the meantime, it seems to last forever. Like that one commercial that pops up in the middle of the movie: it only takes a couple of seconds, but, boy, do they feel like an eternity to you. And another thing I wasn’t particularly crazy about is the gameplay. I like it that the warriors have all sorts of powers, and it’s really easy to use them. But the part with the sword fight…just tapping on the screen when the time is right...it just doesn’t feel real. It feels more like you’re trying to score a goal at Fifa than attacking your opponent in a PVP game. 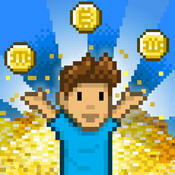 Bitcoin Billionaire is the silliest game I’ve played in a while. But, somehow, instead of getting annoyed by its silliness, I found the game rather amusing and unwinding. Ups: Bitcoin Billionaire is the simplest game ever. Remember when you were younger, and pretended to type something on a computer or a typewriter by tapping as fast as you could on the keyboard? Well, that’s how Bitcoin Billionaire works. Tap as fast as you can, all over the screen, using as many fingers as you can, and win coins. The faster you tap, the more coins you win. In no time, you’ll be a billionaire. Unfortunately, only a virtual one. But what makes Bitcoin Billionaire also a bit engaging is that you have all sorts of quests to complete, and investments to make to get more and more money. Nothing’s real, of course. But it’s quite amusing. Downs: Just like a donkey with a hat is still a donkey, so is Bitcoin Billionaire just a silly game, at the end of the day. Amusing, maybe, but still dumb. The gameplay is…well, silly. There’s really no other word to better describe it. It is a fun time waster, nonetheless. But to call it a good game would be an offence to all the impeccable designed, complex, engaging and intuitive games out there. So no, Bitcoin Billionaire is far from being a good game. It’s just a silly way to have fun.